So far, so good. With Lezyne’s app, the computer easily connected to my phone. HRM and power-meter were easily added. I was so impressed I’ve gotten rid of my Garmin watch and bought a Lezyne Mini Watch as well. The mounts have a great hold and will work well on the gravel. The only drawback for a non mapping gps is that extra mounts are hard to find. This is a brilliant, versatile well featured GPS computer which offers very good value when compared to the competition. It is a small unit with a customisable screen presenting up to four lines and five separate pages. The unit receives Bluetooth and ANT signals from heart rate monitor, power meter , cadence and speed. The unit links with the Lezyne Ally phone app and shows notifications on screen. It also has navigation options and breadcrumb tracking. Information is downloadable to the Lezyne GPS root website and also Strava and training web sites. I find this computer very easy and convenient to use. Easily swapped between bikes. The loaded bundle is extremely good value including Bluetooth heart rate belt, cadence and speed sensors together with different mounting options. I think this is great value for the money. 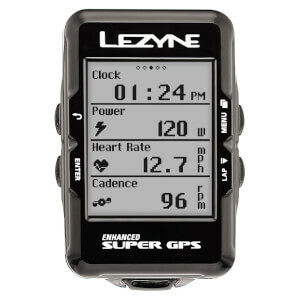 The bundle includes the Lezyne Super GPS, heart monitor. Speed sensor, and cadence sensor. All work fine except Cadence sensor will not pair with GPS. I have contacted Probikekit and they suggest I upgrade the software on the GPS ( which I have already done) Next to nothing on web about this problem. Guess I will see what Probikekit’s warranty plan is like as this company has been great so far. Can’t say enough about GPS.. battery does last forever..
Great computer for the price! Absolutely no complaints. Everything worked perfectly right out of the box. The sensors were easy to attach and only had one slight hiccup with the pairing of the cadence/speed sensor. There's a separate selectable item on the head unit...you've got to make sure you select the combination cadence/speed sensor and not the individual one. Apart from that hiccup...everything else worked as it should. I really like the fact that I can configure the MANY screens on the head unit from my iPhone. That's the way all tiny devices like this should work. Makes things so much easier. I also like the integration with the Lezyne GPS Root...again, works flawlessly, no complaints. Maybe I'm just an easy guy to please? Seriously though, for the money...it does everything that I need it to do. If one day I get a power meter and or those fancy electronic gear change thingamajigs, I'lll be glad I got the Lezyne, cos it can do all those. In the meantime, all I need are heart rate, cadence and speed and this thing delivers at the right price too! Nice bike computer. Displays the data that I want to know. The heart rate sensor works properly, the cadence sensor sometimes loses the connection. The navigation function works very bad, often gives no indication or the wrong direction. This is a simple GPS with a lot of functions which would be good for someone transitioning from a bar mount computer to GPS. I was replacing a lost Garmin 810 which I was pretty happy with, but was attracted to the bundle and the good price. When this unit functions it provides you all of the information you need plus the nice additional feature of live tracking for your loved ones. I found this much less intuitive than the Garmin and the screen much smaller so there was a very frustrating learning curve to get used to it. Unfortunately I experienced a litany of woes with my unit which were not solved by a factory reset so I've sent it back under the warranty which should take around 2 months to sort out with shipping back to the UK. The issues I had included: head unit wouldn't pick up satellites reliably; head unit wouldn't stay paired with speed/cadence and HRM sensors; head unit had trouble finding phone/GPS Ally App. Interestingly my riding partner who bought the same unit at the same time has had no issues with it. If buying again I would certainly look at the new units with larger screens if you think Lezyne is for you. This is juste the best bundle for the price. The Super GPS is good on all terrains, HR monitor works great, speed and cadence works great. Tons of data available as you ride. Easy to dwl roads on your computer and get turn by turn on the GPS after trough the ally app from lezyne. 3rd party website like komoot and ride with gps allow to create route and are easy to enter in the GPS, strava live segments work well if you are premium. Really gotta say for the price this kit is really hard to beat. Yeah it's not in color and the map is pretty basic but it will give all the date you need, got very good battery life and works like a charm! Super GPS with lot of features! Very precise and nice GPS. Works well out of the box. Only drawback is that it is complicated to upload a route. You need to do it via the Lezyne website on your computer and the web app isn't very good. Then you upload to your phone, which finally uploads it to your GPS. I'm a computer guy, but this is a pain. The Lezyne Super GPS Enhanced bike computer bundle is a quality piece of kit, and a decent alternative to Garmin. The computer module itself is clear, easy to read, and configurable to display what information the rider needs or prefers. The quality of the sensors which come in the bundle seem good as well, and instructions for mounting and pairing are clear. While the button’s for interacting with the computer have a good tactile feel, and positive engagement, their layout is not particularly efficient, and depressing them takes some significant effort. That decreases the likelihood of erroneous engagement, but requires more effort when initially setting up or needing to make adjustment during a ride. I was searching for a : - kind of cheap computer (don't want to spend a lot on a garmin) - computer able to display at least 5 infos on one page (don't want to spend my time on changing display) - upgradable computer that allow me to add a speed, cadence sensor and probably a power meter. And the Lezyne does all that very well plus more and more other things ! One of my favorite thing that I wasn't searching for is the ability to be tracked by someone else using their gpsroot website and a bluetooth connection to my phone. Really appreciate and 100% free ! The display is very highly customizable. Each page, each information, the number of info per page, the number of pages and the best : each settings could be unique to each bike you own ! The GPS fix is very quick, pages could be automatically changed each X seconds, they're too much things to say about this computer :) I highly recommend this computer which, IMO, is largely better than any Garmin for half the price.